We’re all familiar with tipping points, when crossing what might seem a minor threshold can lead to drastically different outcomes—the Super Bowl favorite that falls to last place with injury to a single lineman, a tomato seedling that surges skyward the moment it tops the shadowy confines of its clay pot. Now, a study by researchers at William & Mary’s Virginia Institute of Marine Science identifies a tipping point in oyster restoration efforts, wherein reefs rebuilt to reach a foot or more above the bottom develop into healthy, self-sustaining ecosystems, while those rebuilt at lower heights are quickly coated and then buried by sediment. The study, the feature article in the November 6 issue of Marine Ecology Progress Series, is co-authored by former VIMS Ph.D. student Allison Colden along with VIMS professors Rob Latour and Rom Lipcius. It is the second featured article by VIMS researchers in the prestigious journal in the last month. 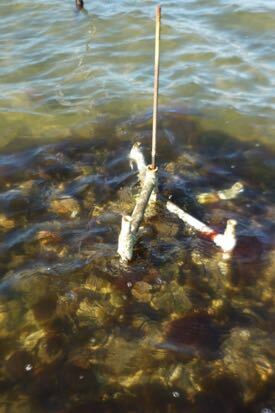 Colden, now Maryland fisheries scientist for the Chesapeake Bay Foundation, says, “Identifying the threshold response of oyster populations to reef height provides critical insights into the degradation and loss of the Bay’s oyster reefs. Understanding this response and its underlying mechanisms can help managers make the most of limited resources by not overbuilding, while maximizing the probability of restoration success.” Restored oyster reefs are typically built using fossil or recycled shells, both of which are in short supply. The researchers say their findings can help explain oyster loss and enhance oyster restoration efforts not only in the Bay but worldwide. Native oyster populations have declined around the globe during the last century due to overfishing, nutrient pollution, disease, and degraded habitat, with major economic and ecological impacts. To answer those questions, the scientists used oyster shell to build 24 experimental reefs across 4 sites in the Great Wicomico and Lynnhaven rivers, tributaries of Chesapeake Bay in Virginia. They built the reefs at 6 different heights, from 5 centimeters to half a meter above the bayfloor—a range of elevations typically used in oyster restoration or repletion activities in the Bay. They then observed these reefs at 8 months and 2 years following construction using a video camera on a small remotely operated vehicle. They also measured oyster density, the rate of sediment deposition, and “rugosity,” a measure of surface complexity. Healthy reefs have lots of nooks and crannies, which shelter oyster larvae and other small animals from currents and predators, while generating turbulence that helps keep sediment off the reef surface. The tipping point or threshold between these two states was 0.3 meters, about a foot. Reefs built to this height or higher had oyster densities 3.5 times greater than lower reefs, and densities on the higher reefs generally increased through time. 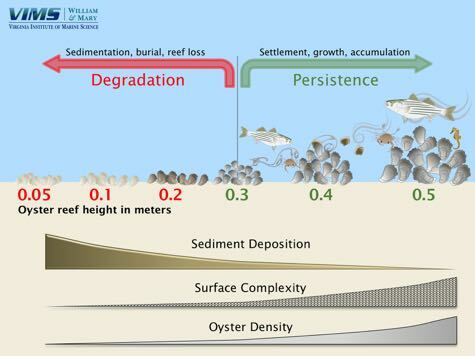 Densities on the lower reefs tended to decrease under a range of sedimentation rates, with most of these reefs eventually disappearing beneath a blanket of sediment. The researchers attribute these observations to positive feedbacks between reef structure, water flow, and resulting population dynamics. The researchers say the relationship between reef height and persistence also helps explain how harvest pressures led to the demise of native oyster populations during the 20th century. Looking forward, the researchers say their findings indicate that restored reefs should extend at least 0.3 meters above the bottom, and should be off-limits to harvest unless managers can ensure the reefs remain above the reef-height threshold under harvest conditions.